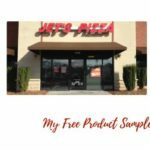 You can get a Free Jet’s Bread or Small Pizza when you sign up at Jet’s Pizza. You will need to fill in the sign up form to join. Plus, you’ll get a free small pizza during your birthday!